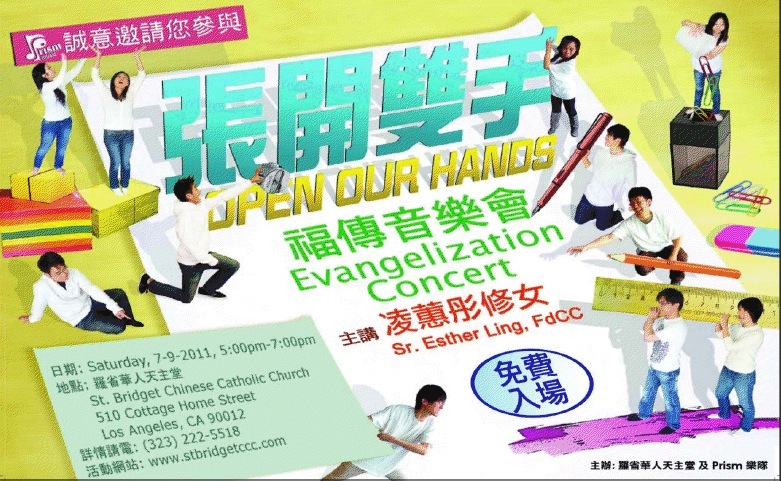 “Open Our Hands” – Evangelization Concert with Prism and Sr. Esther Ling, f.d.c.c. You are invited to an evening of great music performance by Prism and an inspirational talk by Sr. Esther Ling, f.d.c.c. on July 9, 2011 at 5:00 p.m. at the St. Bridget Chinese Catholic Church. Prism is a music ensemble formed by a group of young Chinese Catholics peppered around the Bay Area Community. They spread God’s love and good news to different parts of the world through their music and songs. This time, they are coming to Los Angeles! Sr. Esther Ling, f.d.c.c. (Daughters of Charity of Canossa) will be our main speaker in that evening. She holds a Master’s Degree in Theology from St. Paul’s University, Ottawa, Canada, and a Divinity Degree from the University of London, U.K. She was a Principal at St. Mary’s Canossian College in Hong Kong. Currently, she is a Spiritual Director of the Jesuit Retreat Center of Los Altos; and ministers in faith formation, religious education, and retreat ministry at the Holy Name of Jesus Parish in San Francisco. Let’s Open Our Hands to welcome God’s loving embrace by inviting your family and friends to participate at this evangelization concert!